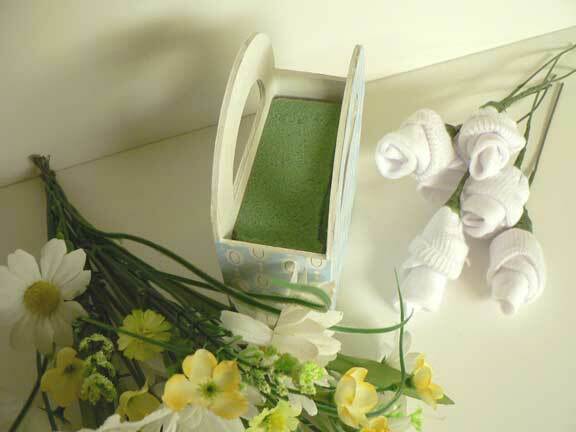 It's simple to make your own bouquet of adorable baby sock roses in a sweet handmade keepsake box container. This makes an adorable homemade baby shower centerpiece idea. 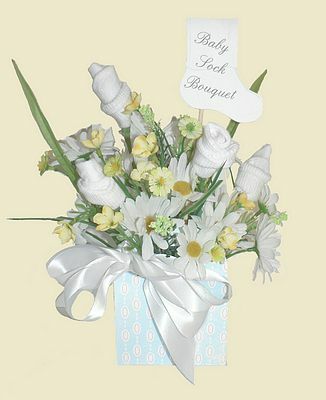 A baby sock roses bouquet is not only a creative and unique gift, but it is also one of my favorite baby shower craft ideas! 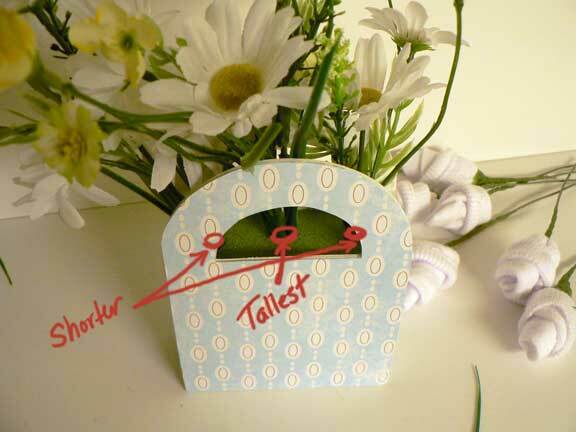 The hostess can assemble the container and coordinating silk flowers early. As the guests arrive, they can be shown how to make the roses, which can be added into the bouquet before it is presented to the Mother to be. 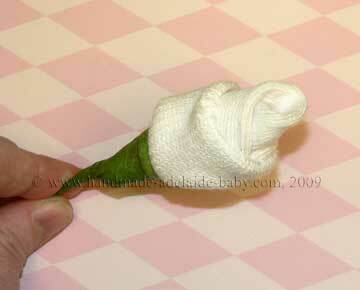 A baby sock rose bouquet is a wonderful and creative baby gift idea. 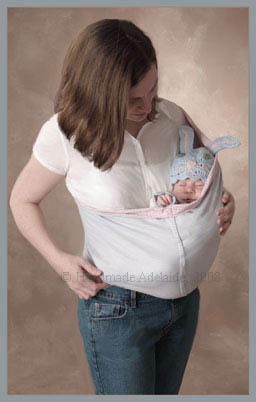 Whether you take it to the hospital, or give it at the baby shower, it's sure to be a favorite! This is such a practical gift, as the socks can be used for baby, and the rest of the arrangement can be displayed in the nursery. 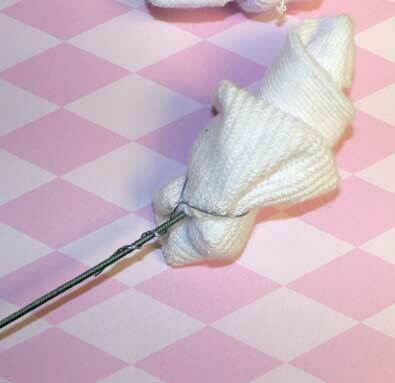 I hope you enjoy making these adorable baby sock roses! If you run into any problems or questions, please feel free to Ask Addie! 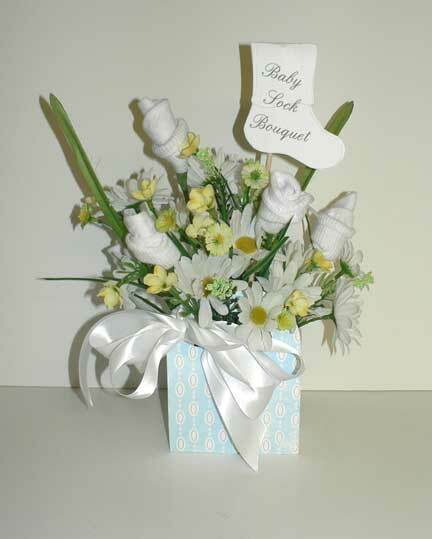 handmade keepsake box or tissue to wrap your boquet in. 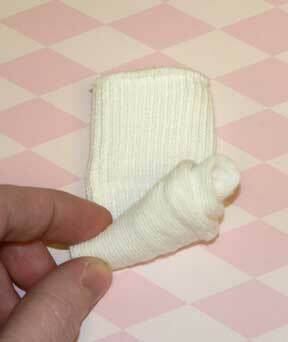 Unfold sock cuff and fold down very tip of the toe, as shown. Begin to roll into a cone type shape-this is the center of your rosebud. The rose from a top view. 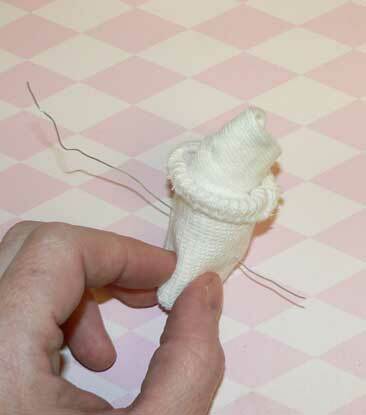 Continue to roll into a nic tight swirl, stopping about an inch from the end of the sock. 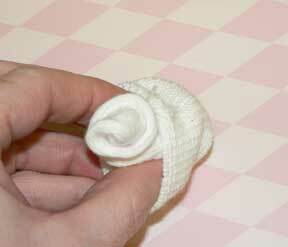 Pinch the bud, and fold the cuff of the sock around it. You may also want to turn down the edge of the cuff as the photo below shows, to give the look of a petal that is curving out. Insert a 3-4" length of fine guage floral wire through all the layers of your rose bud. This is what holds it together, and holds it onto the stem. 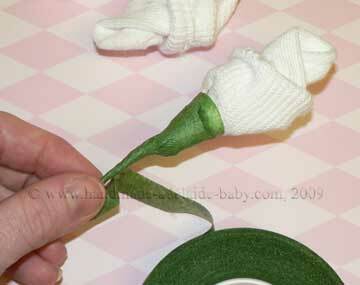 Twist your wires together to hold the rose, and then wrap the wires around a green floral stem wire. Cover the wire with green floral tape. If you've never used floral tape, it's kinda strange stuff. It's more 'tacky' feeling than sticky. 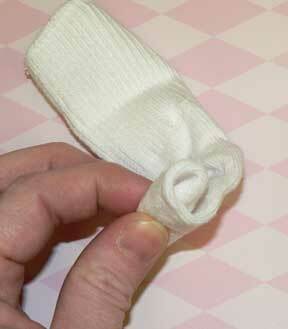 The trick to it is to lightly stretch the tape as you wrap it tightly by twirling the stem in your fingers. 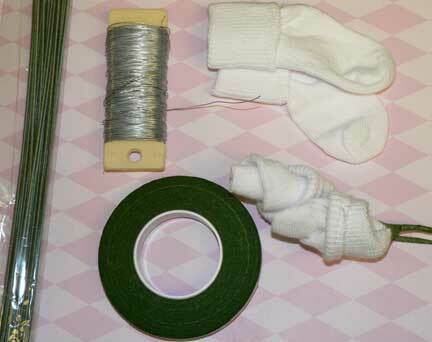 It does a really good job of holding everything together without getting tape goo on the sock. Cut stems to length. Repeat with remaining socks. Cut floral foam to fill your container of choice. Trim your floral stems to length. You'll want the tallest stems in the center, and then softly taper them down to shorter stems on the edges of your arrangement. Use some symmetry when arranging your flowers, meaning that if you put a daisy on the left, you should mirror that on the right. Poke your longest stems into the middle of the floral foam. Make 2 shorter bunches and poke those in at each side. My container is long and narrow. If you have a round container, you will want to add a few more short clusters spaced evenly to fill in around the edges. Bend, arrange and space the flowers so that they look full and natural. This photo shows the arrangement from the top. I added a taller baby sock rose in the center, and then tuck the shorter ones around the edges. 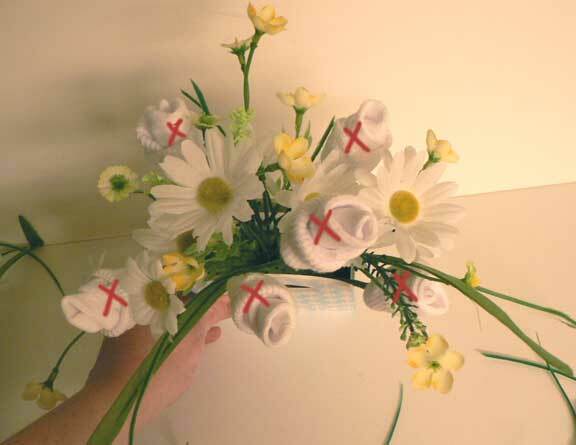 I marked the baby sock roses with a red X so that you can see how they are spaced rather evenly. Finally, I added in short single flowers around the edges to fill in any holes and hide the stems. You can also add a bow. Next, print out the cute sock tag. Fold it in half over a skewer and glue it down. Poke it into the arrangement. 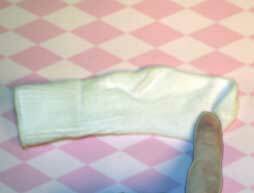 Alternately, you may print the sock tag and punch a hole in the corner. Write a note, and tie it onto the bow, using it as a gift tag. 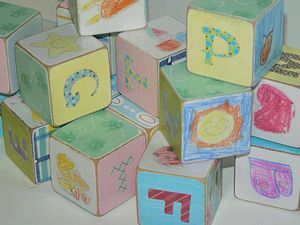 What a lovely and creative baby shower gift basket!